I've known Williams' name for years, but mainly because he has the same name as the British novelist Charles Williams, who wrote a very different sort of book. I'm sure All the Way is more apt, but I will say that Concrete Flamingo is more memorable. Seana: You could be right All the Way might have got lost in a welter of salacious titles. It's more apt, though not for reason you might think. Concrete Falmingo, on the other hand, refers directly to the story, but to just one incident. I learned about the British Charles Williams when doing searches for this one.Several times searches would yield descriptions of books by "Charles Williams," and would think, "Hmm, this does not sound like something Gold Medal would have published." No, he was a Christian writer, but not in any kind of simplistic way. He was a member of the Inklings, so knew Tolkien, C.S. Lewis and a bunch of those guys. I liked him a lot, more than Lewis, when I read him in my college days. Yes, I saw some of those names. 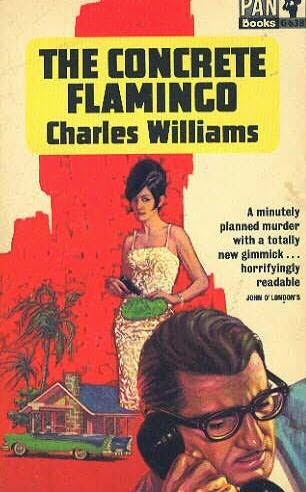 I knew that the crime-writing Charles Williams had been a versatile, but I didn't think he was that versatile. I was right.